We offer a variety of different services to meet all your waste requirements, whether you have household rubble from simple DIY jobs and general Household tidy-ups right through to multi-million pound Refurbishment Contracts and new build Residential Developments. Book here. All of our staff are fully trained and equipped with the skills and equipment to carry out any job big or small. Our teams will quickly and efficiently clear your waste and leave the area clean and tidy for you. Let us do all the heavy lifting for you! Our fleet of specialist rubbish removal vehicles covers the whole of the South East of England including London, Essex, Kent, Surrey, Hertfordshire, Berkshire, East Sussex and West Sussex. Hiring a skip isn’t the only option if you have rubbish, junk or unwanted items to get rid of. Rubbish Clearance Ltd has a range of vans available and you only pay for the space you need. We can often collect your waste on the same day. No need to apply for any permits. Book a convenient time with our head office by calling 0800 138 9100. Cash & Card payments accepted. Rubbish Clearance Ltd is committed to being an environmentally-friendly company. We try and keep as much waste out of landfill sites as possible with over 92% of rubbish being recycled or reused in some way. 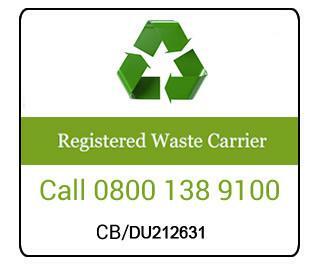 We only use registered recycling and refuse centres and will never illegally dump any waste. Fully licensed and registered with the Environment Agency.